"MOOOOOOOMMM! Anne just (fill in the blank with various and sundry nefarious and dramatic deeds)!" "Mommy! Henry just (fill in the blank with any number of annoying behaviors that he knows Anne hates)!" SO much whining and bickering. No fun for anybody. And then Anne pitched a fit about something that I cannot recall and stomped upstairs. Next thing I knew, it was quiet, which is a bad sign 99.9% of the time. I went upstairs to check on her, and found her face down on the hallway floor, sound asleep. Well. See, that's the .1% of the time when the quiet is GOOD. ;-) She slept for over an hour, and then was considerably less saucy when she woke up, thank the good Lord. In other news, I'm plotting a new novena. 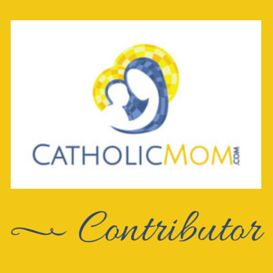 Details are now up on the official St. John Paul II novena tab! The novena starts next Tuesday, October 13th, and goes through October 21st. I have links to a few different versions of the prayers, and I created an audio file of the novena prayer that I chose plus his chaplet prayers. 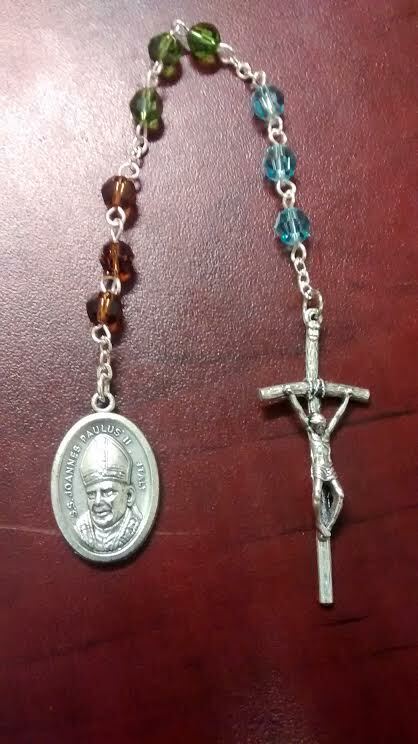 The chaplet (pictured above) is super short, only about three and a half minutes, so download and pray along in your car if you like! I have a short video explaining the chaplet a bit more and the prayer configuration down at the bottom of the Chaplets page. The link to the audio is there as well. I hope that you'll join in!